I sat in utter amazement, nestled in the back seat while my driver, a Sikh wearing a turban, somehow maneuvered the car through a free-for-all frenzied traffic jam of epic proportions. Seven jumbled lanes of misaligned vehicles squished within three officially marked lines. As far as I could see, no rules of the road existed. A cacophony of honking and beeping horns seemed to simply announce, “I’m here.” Bicycles, rickshaws, motorcycles, hundreds of tiny Tok-Tok three-wheeled cars (occasionally overstuffed with people like clown cars at the circus) plus regular size vehicles, buses and trucks and ox carts vied for space. Every once in a while, a stray cow would wander in. I’d been warned the traffic in Delhi is insane; multiply that times ten. It’s sheer madness, but for some reason I didn’t feel anxious. 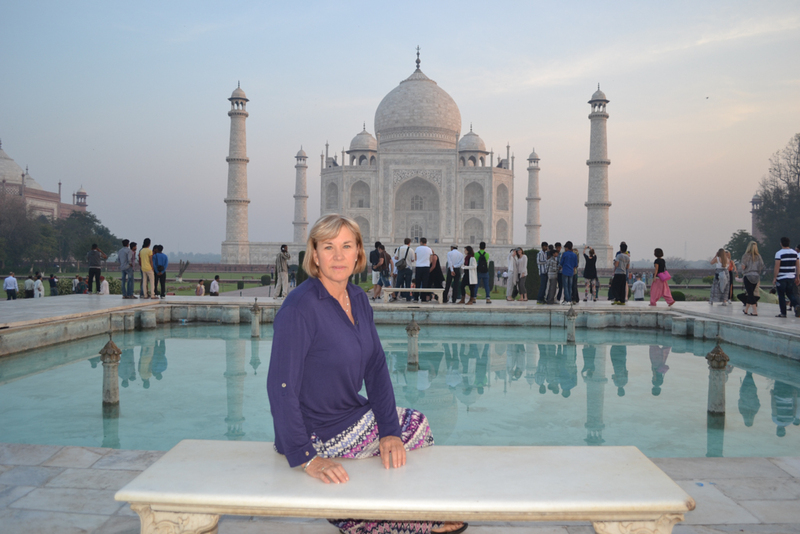 As I child, I dreamed of touring Paris and the Eiffel Tower, the pyramids of Egypt and India’s Taj Mahal. I longed to visit the places I’d see on TV: California’s Disneyland and the Wild West, where I imagined cowboys and tumbleweed rolling across streets. My family never traveled to any of these famous places, although at sixteen I explored Niagara Falls…and was totally enthralled. Still, my dreams remained, so you can imagine how excited I was to recently make my way to India. 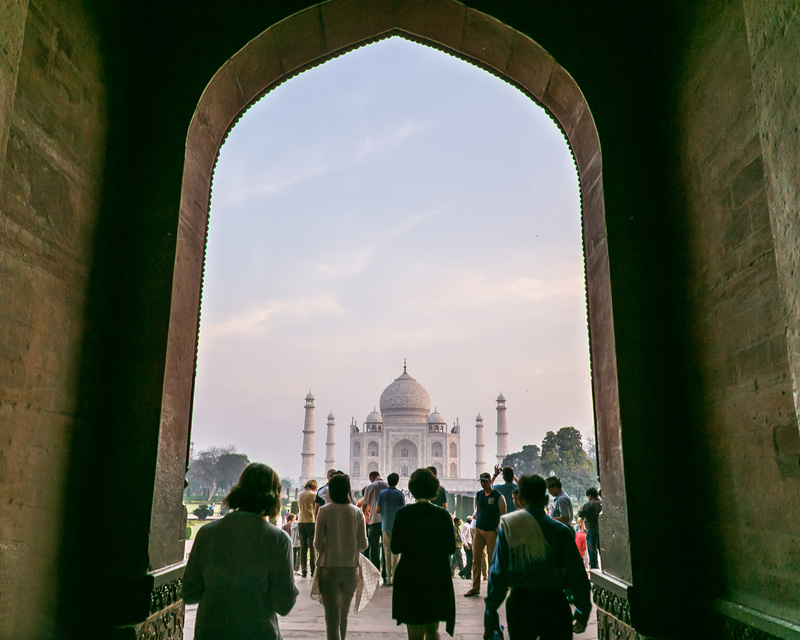 While my itinerary called for adventures in the southern part of the country, my tour of this distant land would absolutely have to include India’s most famous landmark. Following a series of long flights and late night arrival, I wasted no time. The next morning, it was off for Agra, home of the Taj Mahal. 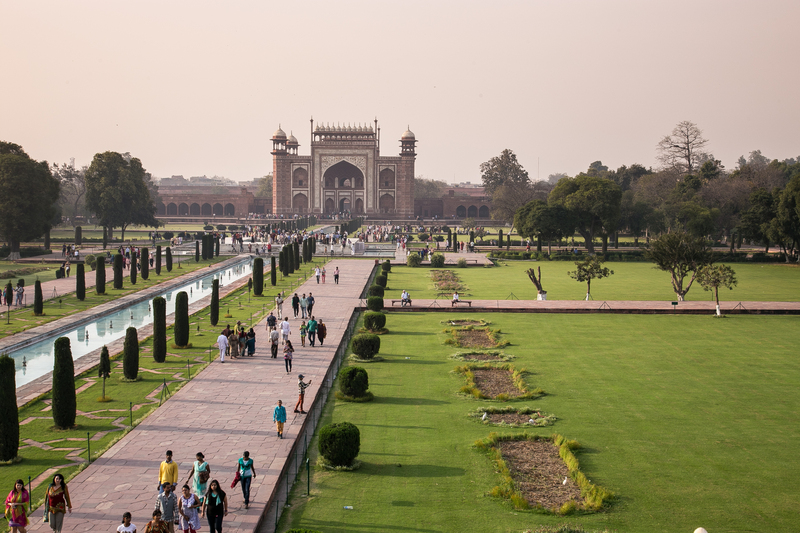 Although Agra lies only 130 miles from Delhi, the trip takes four hours. You need at least one hour to get out of the congested city, two on the new expressway and another hour to get to your hotel once you arrive on the outskirts of Agra. To understand the building, you must know the background story. 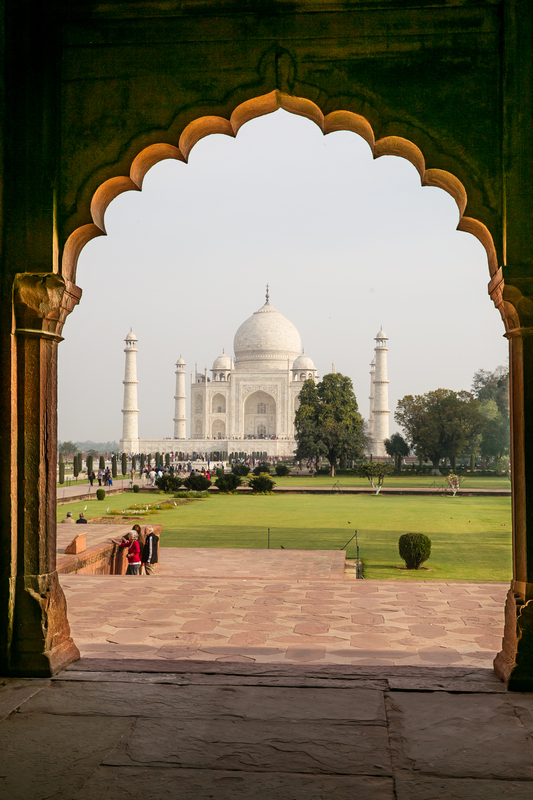 The Taj Mahal was built by the fifth Mughal emperor, Shah Jahan in 163, in memory of his third but the most favorite wife, in fact his soul-mate, Mumtaz Mahal. Shah Jahan was utterly devoted to Mumtaz Mahal, who was his constant companion and trusted confidante and their relationship was intense. She died after giving birth to their 13th child, while accompanying him on a campaign. Her death so crushed the emperor that all his hair and beard were said to have grown snow white in a few months. There was not enough time to visit in the late afternoon, especially since I was still adjusting to jet lag. So I checked into my hotel and had a few hours to relax. However, the property transposed me into another world, one of great luxury. 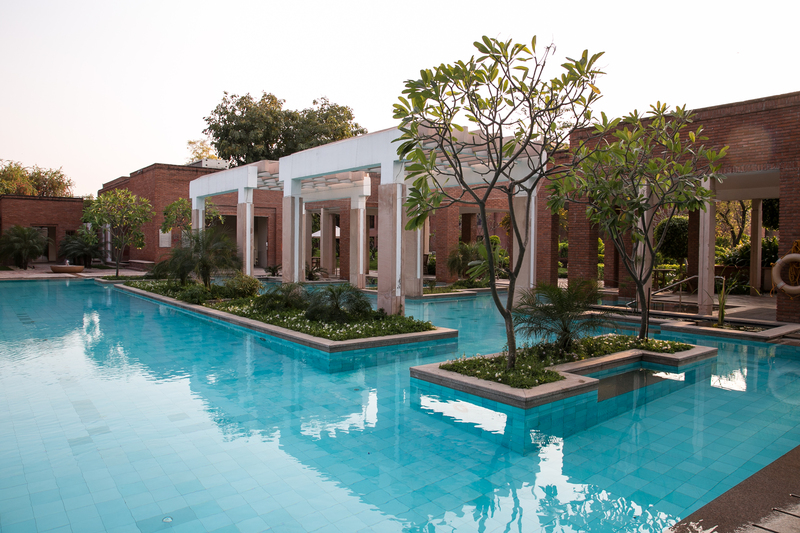 The ITC Mughal Hotel is itself a paradise. Removed from the assaults of the street, I was enveloped in a calm retreat, including 35 acres of gardens. The surrounding beauty enthralled me. I couldn’t rest in my elegantly appointed room. I had to wander the grounds, sit by a secluded fountain and climb the observation tower for another peak at the city’s pride. I was told however, that there was no need to photograph the great monument at night, the Taj is not illuminated. There was not enough time to visit in the late afternoon especially since I was still adjusting to jet lag. So, I checked into my hotel and had a few hours to relax. However, the property transposed me into another world, one of great luxury. 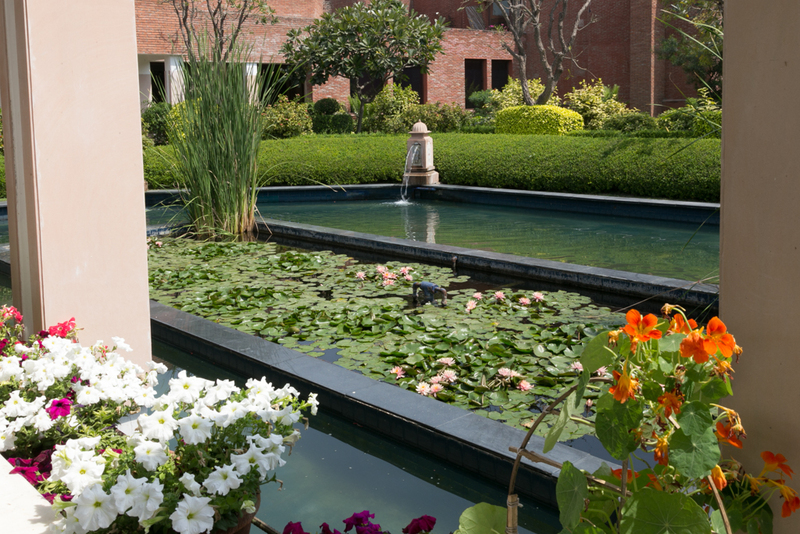 The ITC Mughal Hotel is itself a paradise. Removed from the assaults of the street, I was enveloped in a calm retreat including 35 acres of gardens. The surrounding beauty enthralled me; I couldn’t rest in my elegantly appointed room. I had to wander the grounds, sit by a secluded fountain and climb the observation tower for another peek at the city’s pride. I was told, however, that there was no need to photograph the great monument at night; the Taj is not illuminated. Sometime later, I ate my first Indian meal alone. The next morning, I would be picked up at 6:15 am for a sunrise visit to the shrine. A tray that included a small dish with almonds soaking in water had been left in my room. A note said to eat them for healthy hair, glowing skin and good eye sight. I also found a small bottle of Himalayan water to pour into a copper cup, which should sit overnight and be consumed in the morning to prevent skin problems, anemia and depression. Instead of a chocolate on my pillow, these gifts seemed so appropriately Indian. I expected the pre-dawn streets to be quiet, but I was totally wrong. In fact, I would quickly learn almost all my preconceived ideas about India were wrong. Residents in India arise very early. The park near the entrance to the UNESCO World Heritage site was bustling like an American high school at dismissal hour, except daylight was barely breaking. Throngs of kids were huddled together chatting, others were playing ball, and many were busy walking back and forth to buses. After entering the queue, my camera equipment and handbag were scanned. (Tripods are not allowed.) Guides know the select spots for snapping photos and mine promised to direct me. The trick is to move along and shoot with quick confidence. You will be pushed out if you take too much time. 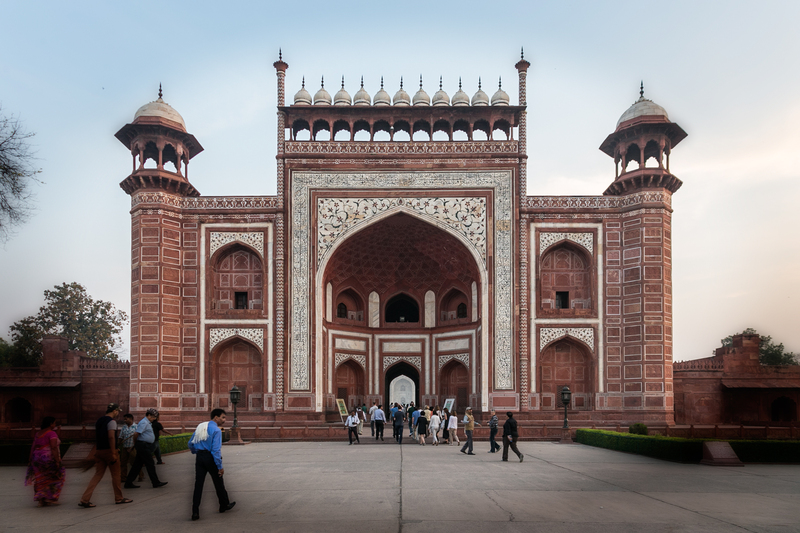 First came a red brick building, the gateway to the Taj. Here, you nab the first glimmer of the majestic marble dome through a grand arched doorway. Whoa – the hair on my arms rose in excitement. The sun’s rays, just beginning to project from the East, cast an array of pale pinkish hues. And me… literally tickled pink to be there. I moved forward to the front of the reflecting pool and felt under pressure to capture the ethereal light as it was changing by the minute. All too quickly, more and more people were entering the property and my photos. Yikes! I rapidly fired off my camera. Finally, I slowed me down and stopped myself. I needed to simply stand still and contemplate the renowned building with its indefinable beauty. No high definition photos or videos do justice. Seeing this structure in person becomes a moment of awe. Graceful and delicate, clean and pure, literally shimmering like a fiery diamond ring – the Taj Mahal is a true wonder of the world. People react to the Taj differently, but as I took my turn and sat on the Princess Diana bench, I felt, as her photo depicted, great loneliness. 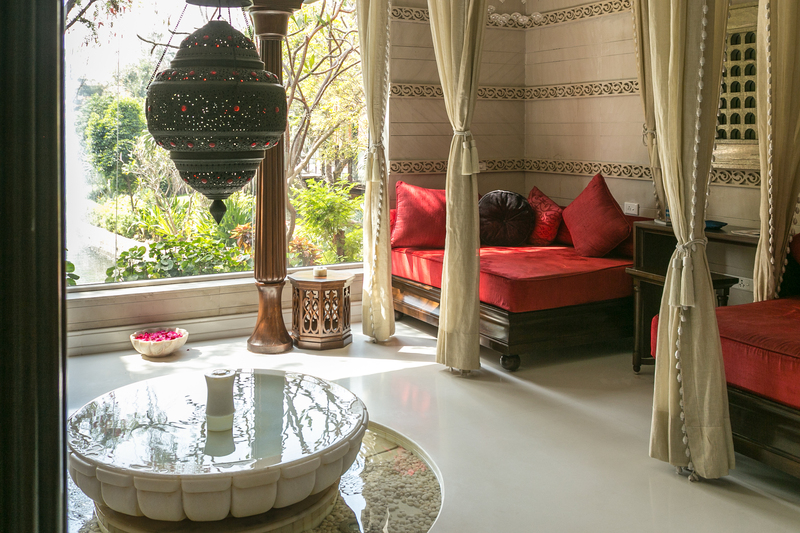 What measure of love and devotion can inspire a ruler to commission such a luxurious shrine? Granted, the indulgence came from an overflowing treasury and political power of that era, but still. A monument representing such intense love is emotionally gripping, especially if you are a woman visiting alone. Having no love at this time, I felt true sadness and loss, but I wouldn’t let myself stay in the bittersweet moment. 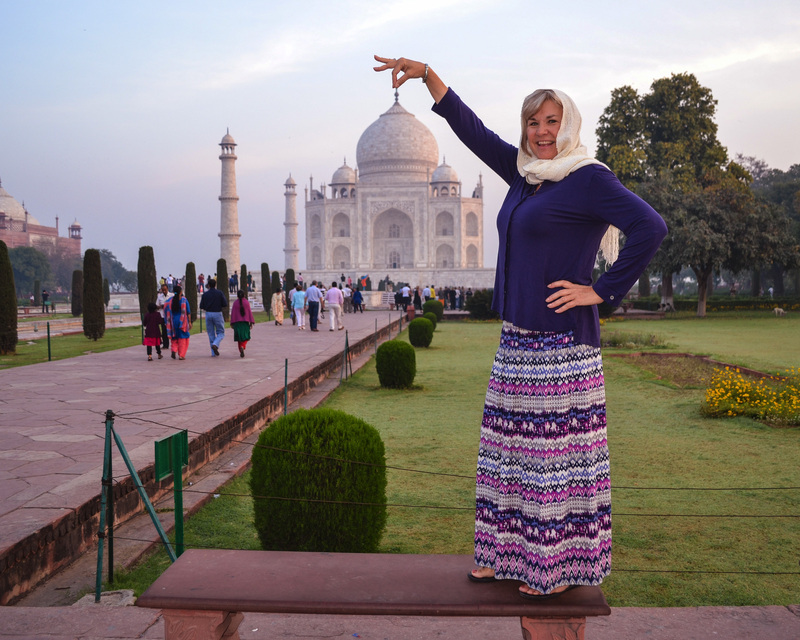 I decided to become playful instead – opting for the touristy pic and hamming for the camera. The ticketed area is a complex of structures with the white domed marble mausoleum as its centerpiece. The main building rises on a red sandstone base, topped by a huge white marble terrace flanked by four tapering minarets. The outer dome rises to 115 feet in height; the inner is 80 feet, an architectural and technical feat or its day. Within the dome lies the jewel-inlaid cenotaph of the queen. The only asymmetrical object in the Taj is the casket of the emperor which was built beside the queen’s as an afterthought. 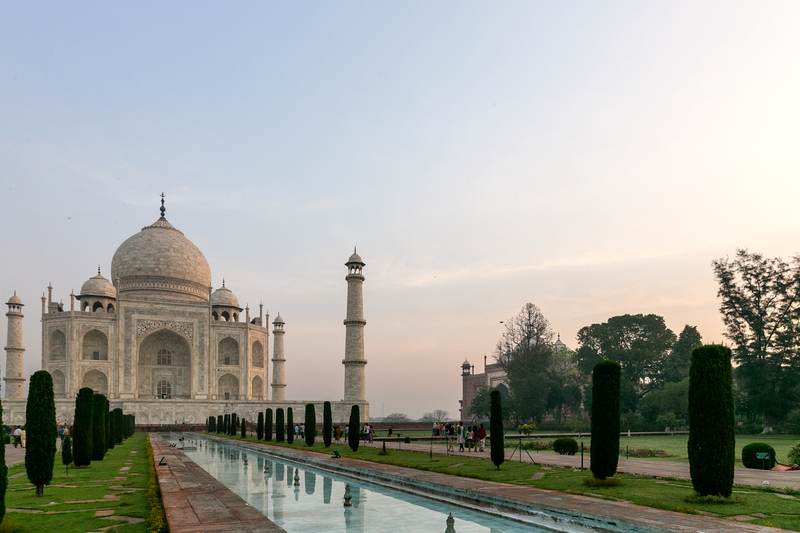 Construction of the Taj began in 1631 and was completed in 1648. About twenty thousand workers were recruited: sculptors from Bukhara, calligraphers from Syria and Persia, inlayers from southern India, stone cutters from Baluchistan, a specialist in building turrets, another who carved only marble flowers. The outlying buildings and gardens were finished five years later in 1653. I was pleased to see preservation a concern. Everybody must place cloth booties over their shoes before climbing the stairs and walking on the marble terrace. The detailed inlay work beckons closer observation and nearing it, I could discern exquisite detail. My guide pointed out the gems, the harmonious curvature in the vines and depth in the blossoms. Each is neatly etched, cut and inlaid to perfection. 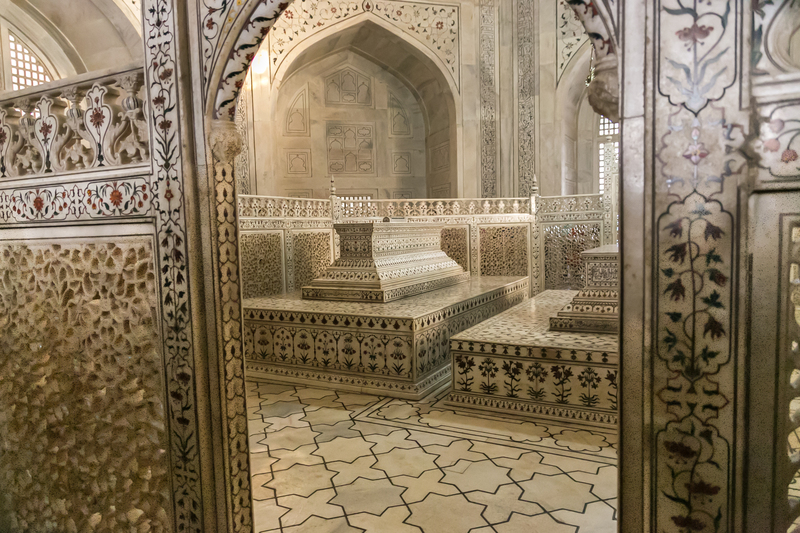 He said one special flower on the tomb of Mumtaz Mahal is inlaid with 35 different precious stones. Such perfection simply leaves one mesmerized. 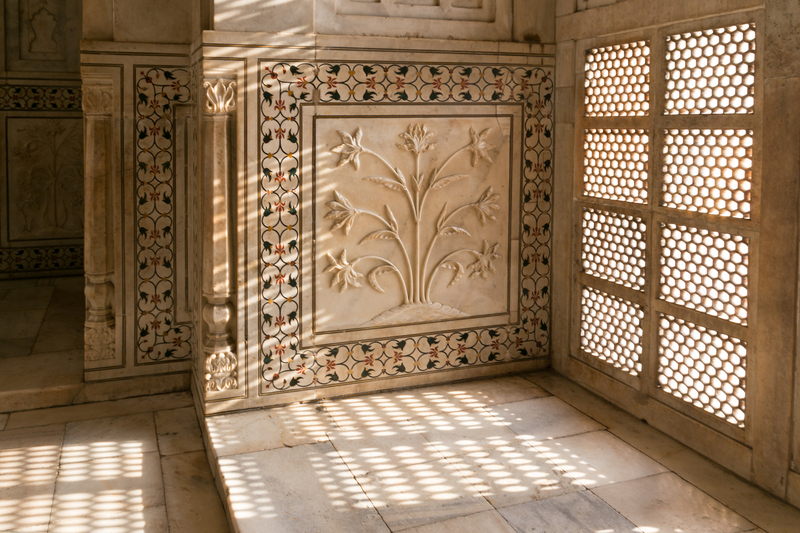 Marble lattice screens, which are elaborately cut in oriental designs, enclose the cenotaphs. The actual graves lie below in the basement, undisturbed in quiet environs. The play of the sun’s filtering rays reflecting off the river and through the lattice work creates a mood of solemn respect. I admit I did not notice the inkwell over Shah Jahan’s tomb or the slate on top of Mumtaz Mahal’s. The official website says they were placed there because “a man writes his desires on the woman’s heart.” Hmmm. After leaving the interior, I walked toward the river and gazed across where the merest foundation for the Black Taj remains. Shah Jahan intended to build a replica in black marble opposite the current monument. However, a war with his sons interrupted his plan. The sons placed him under house arrest as they were particularly opposed to his lavish spending for another shrine. 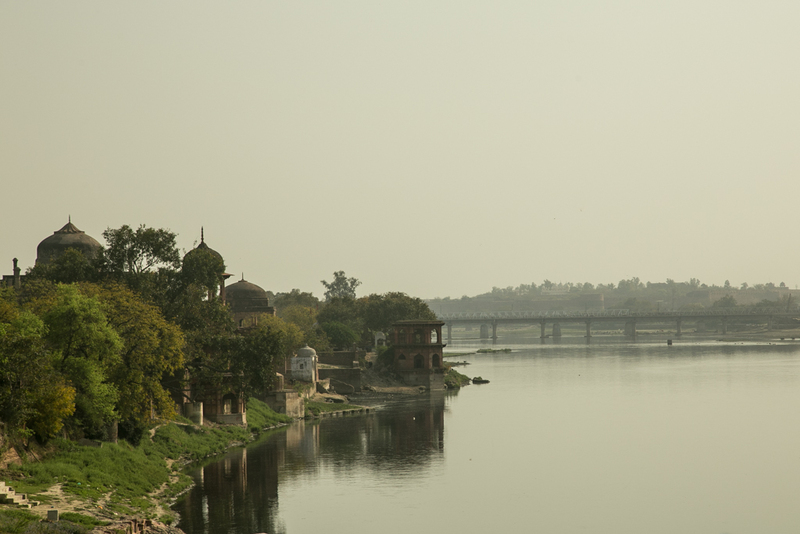 As you glance further upriver, you see the red sandstone fort of Agra; the location where the father was imprisoned. 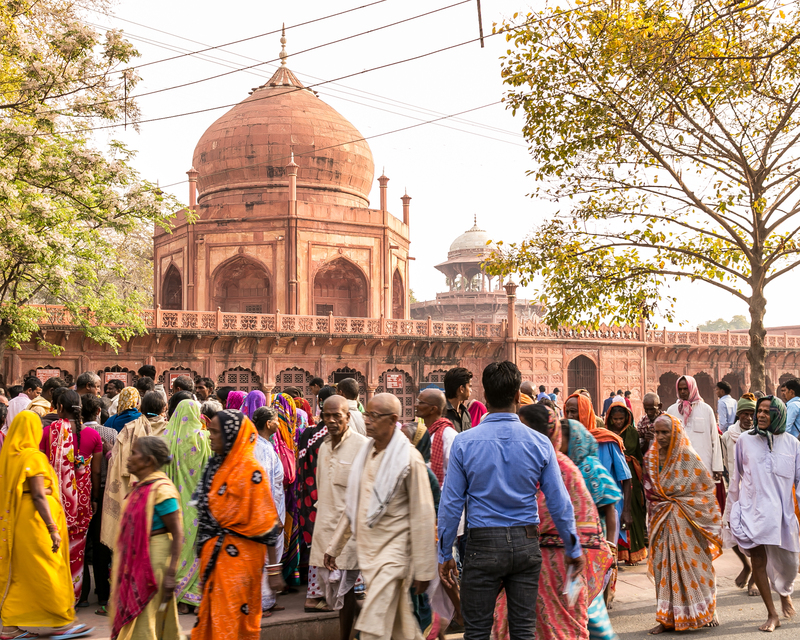 A red brick mosque sits on the left hand site of the Taj, used only by locals, and a symmetrical structure stands on the right, formerly used as lodging. No touring inside either building is permissible. I strolled through the gardens and was very glad that I had come at dawn. Within a few hours, tourists had mushroomed like well watered weeds, pushing forward and disrupting the serenity. The area outside the ticket office was now a disorderly swarm. Others photographs of this site show its varying moods from dawn to dusk. The guide told me a full moon gives the Taj a golden, sensuous appeal and that it shines like a pearl. All I can say is see it for yourself. The romanticism and sheer majesty of the structure is undeniably real. Disclosure: My trip to India was self funded, however, the ITC Mughal Hotel in Agra generously provided overnight accommodations. Before I left the hotel, I toured their Royal Spa, Kaya Kalp, and must say, it is the most fabulous treatment center I have ever seen. Polished dark wood decor is blended with pomegranate colored accents, secluded lighting, marble baths, flowing fountains and the plushest rooms imaginable. No wonder the spa wins major awards. My recommendation for visiting the Taj Mahal is to spend two nights in Agra, allowing extra time to bask in the splendor of the hotel and spa. I, of course, would also suggest going back to photograph the Taj at sunset. To read the Luxe Beat Magazine version of this article click on the title Mughal Magnificence: India’s Taj Mahal.